President Erdoğan jails a 10-year-old boy for being a child, arrests members of the press for asking about it. 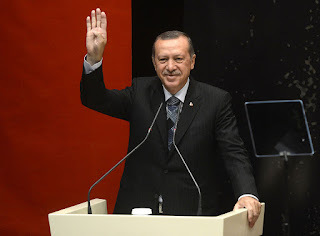 In 2013, Recep Tayyip Erdoğan was Prime Minister of Turkey. ANKARA, TURKEY (The Nil Admirari) - Earlier today, Turkish President Recep Tayyip Erdoğan ordered a 10-year-old boy be arrested and jailed. The notoriously thin-skinned Erdoğan had the boy jailed for sticking his tongue out at him. "I was being driven around Ankara looking for things to be offended by when a child on the left side of the road smiled, stuck his tongue out at me, and then tried to flee the scene," explained Erdoğan. President Erdoğan continied, "I had the child arrested and thrown in jail for making me both very angry and very sad. His actions were not only an attack on me, but an attack on Turkey itself." "The boy will be charged with treason, and so will his parents once we can track them down," pledged Erdoğan. An unidentified member of the press was arrested for asking Erdoğan if he may have overreacted. Another member of the press was arrested for asking why her peer had been arrested.